Mike Nurse, PWS- Mike has over 23-years of experience managing ecological projects as a state employee and private consultant. Mike has a wide range of experience with aquatic ecosystems from a local and landscape perspective. He has worked with MDNR Fisheries Research Division and DEQ Land and Water Management Division where he was the lead analyst and manager for the most complex and controversial wetland projects in the district. He is very familiar with wetlands, inland lakes and streams, and Great Lakes regulatory permitting programs. Aaron Snell, M.S. 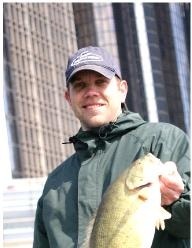 - Mr. Aaron Snell earned a Master of Science degree in Fisheries and Wildlife from Michigan State University in 2001. Since that time, he has been actively involved in all aspects of biological and morphological stream and river assessment throughout the state. He has completed stream assessment and restoration training courses through Ohio State University, North Carolina State University, Dr. Robert Newbury and Water Survey of Canada (Regina), and was one of the first people in Michigan to complete the four part series offered by Dr. Dave Rosgen, Wildland Hydrology. Mr. Snell is intimately familiar with grant writing and administration, having secured over $2 million in project funds. He has worked on dozens of projects, from southeast Michigan to the Upper Peninsula’s Keweenaw Peninsula, focusing on aspects of streambank stabilization, natural channel design and habitat improvement for many fish species. Recent projects include a fish migration barrier inventory in the St. Joseph River watershed, coldwater habitat improvement of over a half mile of the Coldwater River and streambank erosion study of the Maple and Looking Glass Rivers. Aaron was recently awarded the 2011 “C.R. 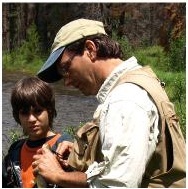 Evenson Resource Professional Award” for his conservation efforts with Schrems Trout Unlimited.